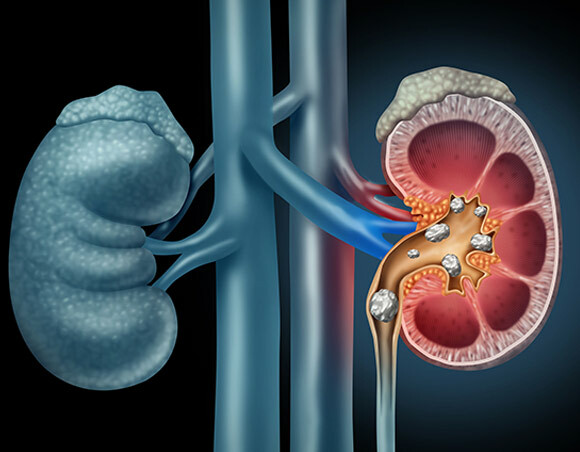 HEREDITARY factors have shown to be an important part on whether or not you’re prone to kidney stones. Cases of lithiasis are often found throughout families and can persist through generations. ARTHRITIC DIATHESIS. It’s not unusual for us to see patients that have suffered with rheumatoid conditions eventually presenting with lithiasis as a co-morbidity to arthritic disease. CERTAIN DIETARY Diet can often be a factor in developing kidney issues, protein rich diets can cause hyperuricemia and strict vegetarian diets are known to be a factor in developing oxalic lithiasis. Different foods produce different types of stones. The physician must determine which food causes the damage. VITAMIN IMBALANCE. Many vitamin deficiencies can influence the development of uririnary problems, notably Vitamin A deficiency has been show to produce keratinization of the urothelium. High levels of Vitamin D can also be a factor. ENVIRONMENTAL or SOCIAL factors can be a cause in developing kidney issues, such as stress or fear in times of warfare or violence. CERTAIN METABOLIC ALTERATIONS can also cause kidney issues, including hormonal imbalance of calcium, oxalic and uric acid, cystine or xantine. HYPERTHYROIDISM. Produces an increase in calcium and phosphorus in the urine that can alter the colloidal balance and ensuing formation of precipitated salts causing kidney issues. SUSTAINED INMOBILITY. For example, after major trauma or other long illnesses that make make can make it difficult to physically move to the toilet or actually urinate. UROLOGICAL ALTERATIONS can result in OLIGURIA and ALBUMINURIA as well as any remains of leukocytes or bacteria associated with infections can lead to crystallisation. Clots, in the case of hematuria can form the initial core of a stone. SOME MEDICATIONS have proven to help cure kidney stones. This is because often medications may contain high alkali ; or some other properties derived from sulfonamides which can help with the elimination of crystals. These medications include Aspirin, Antacids, Diuretics, certain Antibiotics, certain anti-epileptic medication and certain antiretroviral medication. If you have a calcium-containing kidney stone, eat less salt and salty food and try not to get more than the recommended daily amount for calcium or excessive amounts of vitamin D.
Limit your coffee, tea, and cola. Caffeine’s dehydrating affect can make the curing of kidney stones more difficult. Unfortunately if you have had kidney stones in the past you are more likely to have them in the future.